A green eyed, sleek and elegant chocolate or lilac shorthaired cat, the Havana Brown is another rare cat breed (I rank this breed in terms of rarity at 7 out of 10, where 10 is the most rare) and a hybrid. The hybridization is as a result of human intervention (i.e. not naturally occurring), which started in the UK in the 1950s when breeders developed a solid chocolate cat of modern Siamese type. The body shape is, therefore, semi-foreign (slenderish). In the late 1990s, apparently there were only twelve CFA-registered Havana Brown breeders with less than 130 unaltered (not neutered or spayed) cats3. The breed almost died out, it seems. I am immediately struck by the glossy nature of this cat’s coat. You can clearly see this in Helmi’s fine photograph of “Fraulein Katz” (great name) heading this page (of course, she is lit beautifully by Helmi and Ken, to show off her coat). The coat color is what is called “self-colored”. This means a solid color, caused by each individual shaft of hair being of a single color as opposed to a banding of colors caused by the Agouti gene (I discuss tabby cat coats here). The Agouti gene is referred to a lot as it affects the coat appearance of a number of cat breeds (e.g. the Abyssinian and Chausie). The self colored cat has a rich luster. This cat has had at least two names, the origins of both are founded in human consumable products. It seems that, “Swiss Mountain Cat” (see history below) originates in Swiss chocolate (well known country of manufacture) after the coat color. I can only presume this is the case as there seems to be no explanation. The name “Havana Brown” originates presumably in the famous Havana cigar (a brown object). The colour was called “Havana”. Another theory about the name is that it originates in the Havana Rabbit (similar color and silky coat). See some more Chestnut Brown cat. 1350 – 19th century – Reference to this breed in manuscripts written between these dates, it is said. Some cat fanciers believe that this cat breed originated in Siam (now Thailand). It is said that the Havana was imported to Britain with Siamese cats in the 19th century. Early 1900s – World Wars I & II interfered with the breeding of this breed, which, when coupled with the 1920 (or 1930) declaration, (see below) had a very negative impact on this breed. 1920 or 1930 – Havana Brown ignored by the Siamese Cat Club of Britain who make a statement discouraging the breeding of Siamese cats that are not blue eyed. This spelled the end for this breed as a show cat. I have not seen an explanation for this decision. 1950 – First Havana Brown imported into the USA. 1952 – With research into the genetics of this breed and a breeding program commenced by 5 breeders, the breed was “restarted” in the UK (see below). Also shortly beforehand an accidental mating between black Shorthair and Seal Point Siamese resulted in the first of this breed, apparently, to be registered in UK. 1959 – First of this breed achieves CFA Grand Champion Status (name of cat: Quinn’s Brown Satin of Sidlo). This cat is one of the founding Havana Brown cats in the USA and Canada1. 1959 – The breed was recognized by the then United Cat Federation. 1964 – CFA grant full status to this breed (this appears to conflict with the 1959 entry. 1970 – In the UK this breed is renamed a “Havana” Note: this cat breed is of a foreign type appearance (see below – modern development). The breed having almost “died out” (see above 1900s), breeders developed the Havana Brown by mating black domestic cats (moggies) that carried the recessive gene with seal or chocolate point Siamese cats to produce a cat with a solid brown coat . The most often used breeding program to produce this cat is a cross between the black Shorthair and Seal Point Siamese with the chocolate gene. In the UK, apparently, the Chestnut Brown or Havana, as the Brits call this cat, has been breed back to the Siamese (I presume this means the Modern Siamese) losing the original look and looking like the Oriental Shorthair (fine boned and very slender). In the US as you can see from these pictures that this breed has retained for me at least a very nicely balanced and “normal” appearance. Although the head is longer and has higher cheek bones than what I would call completely normal. The cats on this page seem to show to the camera very pleasant characters through their open expressions. All the photographs in this collage are ©copyright Helmi Flick. Please respect it – thank you. This cat has a pleasant demeanor and is very people orientated (inherited from the Siamese no doubt). They are playful and inquisitive and need a lot of attention. As you can see she is an average sized cat, athletic looking, slim and lithe. Ideally, the coat is in fact a deep mahogany brown (reddish brown – see the top three photographs of Fraulein Katz, Hershey and Spider). It has been said somewhere and referred to in the Legacy of the Cat that some Havana’s “were associated with a not-too-pleasant-dispostion”. This may be misleading. It is said that they have a soft and gentle personality if given sufficient attention. All domestic cats need attention. TICA recognise the lilac colour (“pale tan with a touch of pink”2) that was introduced by Russian Blues that were involved in the creation of this breed (but see update below). The eyes, in perfect harmony with the reddish mahogany colour, are a gorgeous green. The head shape is long, narrowing to a slim muzzle. There is a “pinch just behind the whisker pads”1. The muzzle looks almost square. From 1973, although the CFA called this breed a Chestnut Oriental Shorthair1it seems that the Havana is different from the Oriental Shorthair as the muzzle is more “puffy” and the profile slightly different (source: Legacy of the Cat by Gloria Stephens and Testsu). Note: the CFA register this breed as Havana Brown currently (Oct 2010). 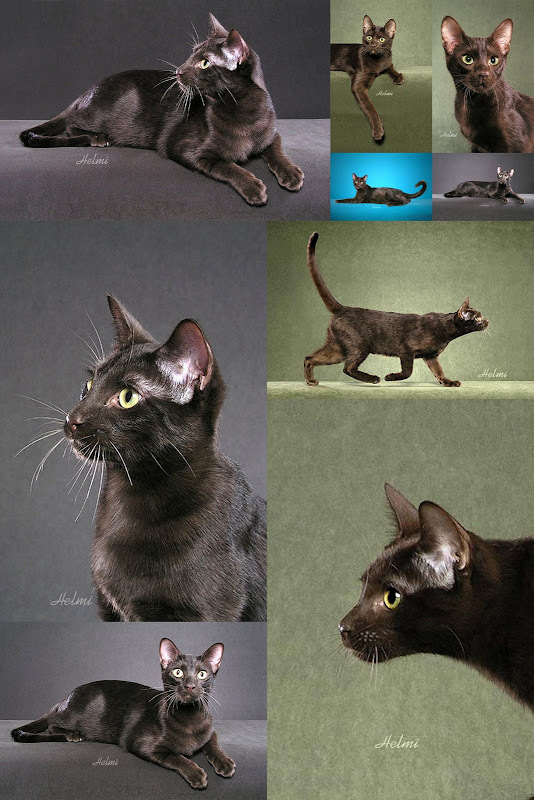 Update Feb 2012:“The Havana Brown is and always has been a completely separate breed from the Oriental Shorthair. The head of the Havana Brown is part of its very unique type — we are looking for a longer head with a distinct muzzle. Lilac or lavendar is the natural dilute of chocolate — it was not a color that originate with Russian Blues being bred to Havana Browns.” This comes from Xocol Havana Browns. Thank you for your valued input. You can tell a lot from an Internet search. There are few Havana Brown breeders. In an article written I believe in or around 1997 (I could be mistaken) there is reference to there being 36 Havana Brown cats registered with the CFA. This is still a rare breed. Apparently the small numbers are allegedly due to the failure to establish a sufficient number of breeding lines because it was forbidden to outcross. This has meant few choices of cat from a limited gene pool from which to breed, restricting the breeding process. Outcrossing has now been permitted (since around 1998). See a short post on Havana Brown genetics. As mentioned on other pages I only list independent websites (non-directory sites). There were none in the first 3 pages on a Google search listing at 2008! Things change. The only one listed before page 6 is: Mokolea Cattery. It is not obvious where they are located but it is the USA. The owner is on the CFA breed council. 1. Encyclopedia of the Cat by Dr Bruce Fogle. This entry was posted in Cat Breeds, Havana Brown and tagged cat breeds, havana brown, Havana Brown Breed Standard, Havana Brown cat, pictures of cat breeds by Michael Broad. Bookmark the permalink.